On March 23, coming across a manhole with a faulty cover, I took a photo and tweeted about it. I was worried that some small child or animal might fall into it in the evening or night when streets in Kathmandu go pitch dark for lack of street lighting. By the time I finally discovered it fixed, it was already April 11, three weeks since I had first come across it! I don’t know if any mishap occurred in the meantime. In late April, I came across this in Thamel. After it was completed, wooden planks and what looked like a sack was all that covered the manhole (see below). There was no signage anywhere. Again, I don’t know if any mishap occurred there. But, there have been mishaps of late, the kind that I feared! 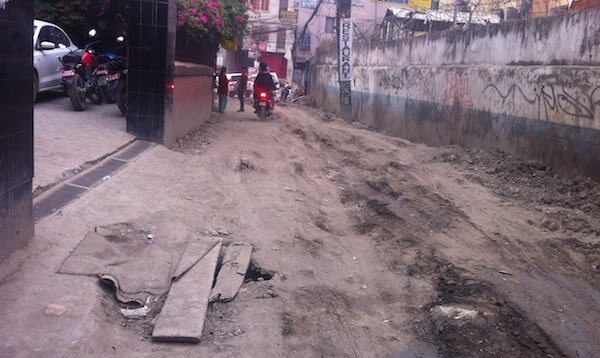 Roads in Kathmandu are in a constant state of construction and therefore hard on everything from shoes to vehicles! 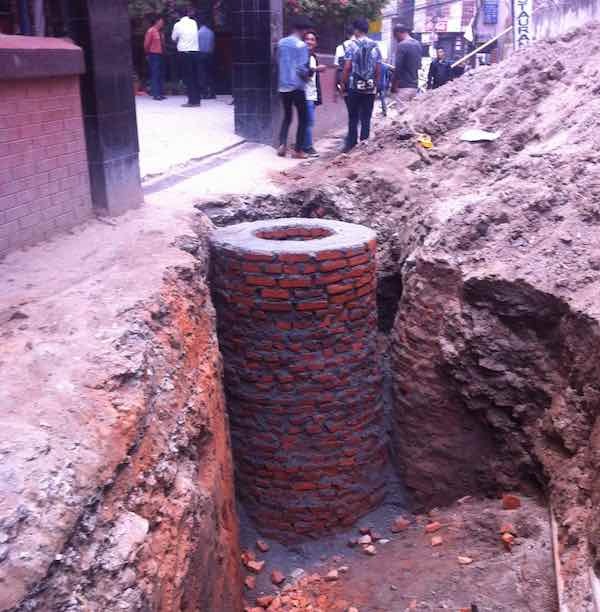 Following the digging of the streets up for the Melamchi Drinking Water Project pipes, most roads in the city have been in some state of construction for a while now and will probably continue to be so for a while longer still. What’s more, no different from other road works, all of the current work have appeared to be chaotic, haphazard and ad hoc, with little regard for the health and safety of everyone concerned — both the workers and the those using the streets. Leaving manholes completely or partially exposed but with no accompanying signage, or similar, to alert pedestrians and drivers about it, is just one example. 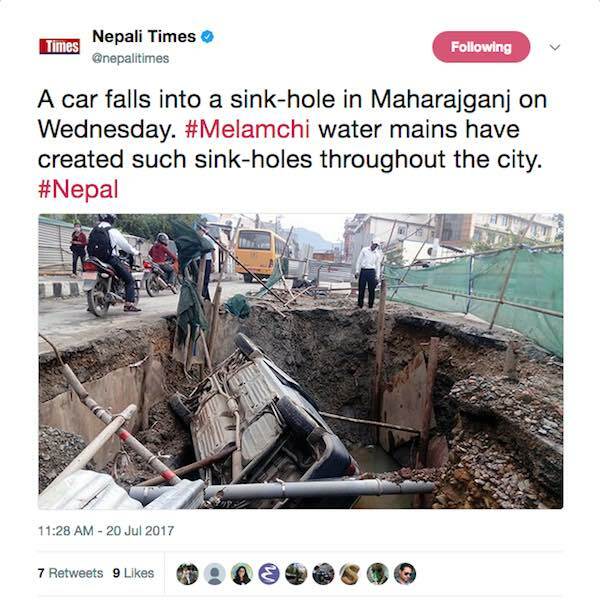 They are especially dangerous in Kathmandu for two reasons: one, lack of street lights, which has already been highlighted, and two, rain flooding the streets and hiding them! About a week ago, a primary-school age girl, returning home from school walking along a heavily flooded street, died after falling into one of them, from what I understand. Another school-age girl also almost lost her life when she fell into a hole also invisible to the eye for the same reason! After being sucked down and carried several meters by the current, she popped up and was miraculously saved. I watched the video of the incident, recorded by one who sounded also young and traumatized by what she was witnessing unfold right in front of her eyes! A buffalo too fell into an open manhole! All three incidents are documented in this article published last Monday in Setopati. The article, rightly points out how we have no record or statistics on mishaps resulting directly or indirectly from the highly irresponsible manner in which road works in general are carried out in the city. 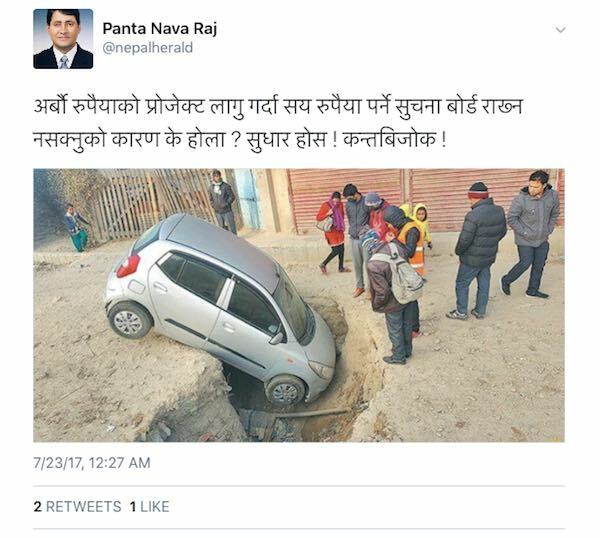 Just days ago, a car fell into a sinkhole! The following, I came across on Twitter, yesterday! Again, to reiterate something I have said before, it’s not that the concerned authorities and departments can’t do their jobs efficiently and well. They can; they just won’t, unless they have to for one reason or another, as these two examples will show. When a bent cable pole was jutting out dangerously into the road in Sorakhutte, following a bus crashing into it, within forty-hours the problem was taken care of! A long stretch of road in Samakushi that had been under a constant state of construction for three years, was fixed within a week when the locals raised a stink about it. In the last ten years, more people have died on the roads than in the ten-year civil war between 1995 and 2005! What percentage were due to their poor conditions? We’ll never know! And no different from how most leaders, politicians and bureaucrats in the country work, following the incidents, the current Prime Minister ordered the open ditches etc. fixed within 15 days! What’s the Prime Minister doing issuing such directives?! What happens if they are not fixed in 15 days? Will he hold the concerned departments actually accountable? When will our government officials ever be proactive instead of being reactive like so, as always? How long before our leaders, politicians and bureaucrat plug the holes in the way they pretend to serve the country and the people, which really is responsible for the holes on the streets of the city in the first place? But, if we were to listen to people like Kishore Thapa, a former bureaucrat and the Sajha Party Kathmandu Metropolitan City mayoral candidate in the recent local elections, we should NOT be calling on the government for help. My Republica (Aug. 4, 2017). Narayanghat-Mugling road becoming ‘deathtrap’. Highway re-construction work turns fatal for travellers. A mind-blowing response from someone in position of authority to the above incident, if the following Facebook post is to be believed. He blames the victim!